In its Q2 results, Wipro has reported notable improvement in revenue growth, helped by better execution. Notwithstanding a subdued financial performance, Wipro shares gained 9% after the first quarter results were announced in July. The Sensex and the BSE IT index during the time were down 5-7%. The gains, which came after a period of underperformance, were driven by positive management commentary and a large order win. The September quarter (Q2) results should reaffirm the investor’s faith. Even excluding the large order, Q2 has seen one of the highest order bookings in recent times. The management claims a robust order pipeline. Constant currency revenues are up 5.1% from a year ago, significantly higher than the growth rates it reported in recent quarters (see chart). On a sequential basis, revenues were up 2.8%, higher than Street estimates and the company’s guidance. Better execution and revenue accretion from a large deal win helped the company. Reported margins were hit by a loss emanating from a settlement with one of its customers, but net utilization levels perked up to 85.5% yielding higher efficiencies. 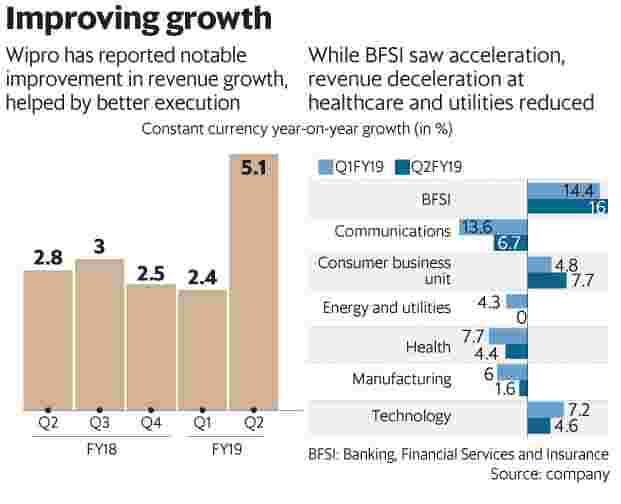 In the business segments, revenue growth rates in banking, financial services and insurance, which generates over a quarter of Wipro’s revenues, improved to 16% from 14.4% in Q1. Revenue deceleration at the troubled healthcare, manufacturing and utilities segments eased. The performance should aid the stock, which is trading at a considerable discount to its larger peers TCS Ltd and Infosys Ltd. But much depends on how the company navigates near-term headwinds. The revenue guidance for the quarter ending 31 December translates to a sequential growth of 1-3%. Business in technology is expected to be weighed down by furloughs. Momentum in healthcare, too, depends on enrolments in US healthcare policies. But the near-term pain should not blind investors to medium-term prospects, argue analysts at Elara Securities (India) Pvt. Ltd. They expect the strong deal pipeline to help Wipro match or exceed average peer growth rate next year. “Our recent interaction with Wipro chief operating officer and industry sources suggest a strong pipeline for Wipro, and we expect this to lead to growth as good or better than peers in FY20," it said in a note.